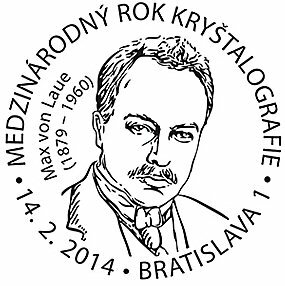 The issue of a postage stamp devoted to the International Year of Crystallography is a very good occasion to popularize new discoveries in this field of research. One of the basic thoughts in the search for a crystal structure is a presumption of its symmetry and of the periodic arrangement of its basic building elements - atoms, and in many cases molecules. Since we live in a three-dimensional space, we intuitively and usually correctly understand three-dimensionally ordered structures. However, improving experimental methods allowed us to discover that there is an important group of solids that deviate from this strict rule, while their properties are related to seemingly negligible deviations from the well-established order. Stamp seen in visible and ultraviolet light (UV). Under UV, a protective layer is seen that includes additional detail. See text below for explanation. With the help of electron density isolines in the Ta-Ge-Ta alloy crystal, the postage stamp shows that instead of the expected placement on a straight line, atom positions are modulated so that they create a crenel, which ultimately results in a change of the properties of the substance. 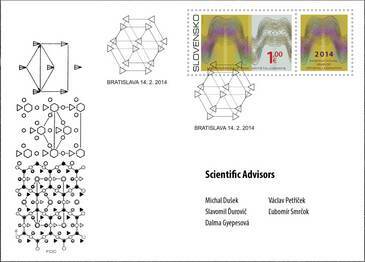 The motif depicted on the First Day Cover (FDC) shows such usage of symmetry that abstracts (from bottom to top) from a specific atomic arrangement in a kaolinite structure to symbolic schemes of order-disorder (OD) theory that, reflecting the laws of symmetry, lead to a simplified and more understandable presentation. The design of the FDC cancellation represents a fragment of such a structure. 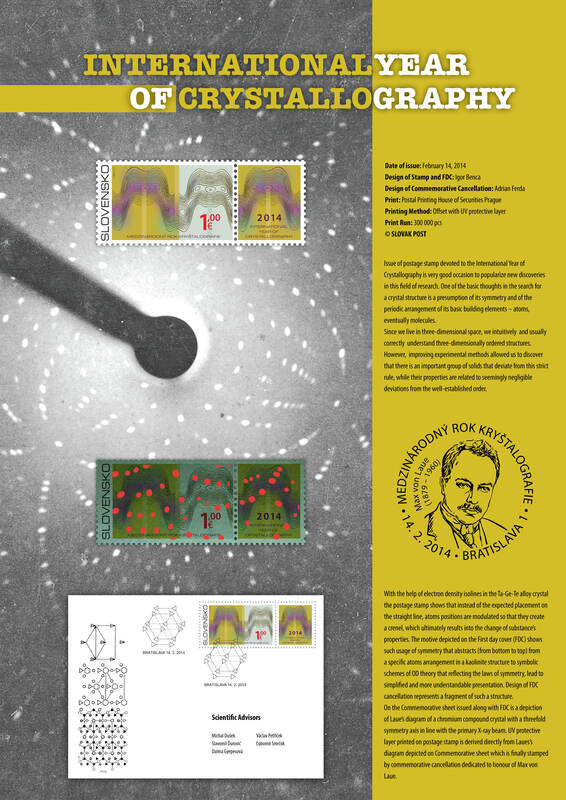 On the Commemorative Sheet issued along with the FDC is a depiction of Laue's diagram of a chromium compound crystal with a threefold symmetry axis in line with the primary X-ray beam. The UV protective layer printed on the postage stamp (emulated by the version of the image overlaid with red dots in the animated main picture) is derived directly from Laue's diagram depicted on the Commemorative Sheet, which is finally stamped with a commemorative cancellation dedicated to the honour of Max von Laue.